Leicester take a big stride towards the play-offs with a breathless derby victory over top-four rivals Northampton. Live updates from Northamptonshire have now finished. Thanks for joining us this week. You can follow the weekend's football, rugby and Formula 1 via the BBC Sport website , or on our Twitter feed . And we'll be back on Monday from 08:00, with all the latest news, sport, weather and travel for Northamptonshire. It will be a dry night with mainly clear skies and possibly a few fog patches. There could be a touch of frost in sheltered spots, with a low of 2C (36F). After a chilly start, Saturday should be fine and dry with long spells of sunshine. There'll be a light to moderate north-easterly wind and inland temperatures could reach about 14C (57F). There's more at BBC Weather . Bosses at Northampton General Hospital say people are using their relatives' hospital stay to go on holiday or make home improvements "without considering whether they will be back or building work will be complete when the relative is ready to be discharged". The hospital says families are also "failing to turn up for meetings with staff from the hospital and social care to discuss and agree discharge arrangements". There are currently 15 patients who are medically fit for discharge but are unable to return home because their families are "unwilling" to take them home, or they are "arguing and refusing a transfer of care to the community", the hospital claims. Bosses say they admitted their highest number of emergency patients over a seven-day period last week, and the failure to discharge healthy people added to that pressure. The organisation that runs it says it would be prepared to continue operating the service while it negotiates with the local clinical commissioning group (CCG) over funding. Earlier in the week Lakeside Plus said it would close the centre on the last day of March. Lakeside Plus said the Corby CCG doesn't pay it enough per patient, causing the centre to run at a loss of £30,000 a month. For its part, the CCG said this week that if necessary it would find another provider to keep the service running. But now Lakeside says while the two sides try to thrash out a deal, it would be prepared to continue. It has written an open letter to the CCG outlining its plan to keep the centre open. You can find out how to get into triathlon with our Get Inspired guide. 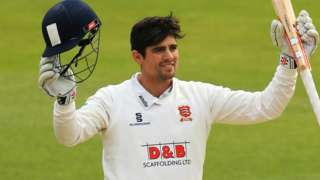 Former England Test captain Alastair Cook is available for Essex's three opening County Championship games of the season. M40 Warwickshire southbound severe disruption, between J12 for B4451 and J11 for A361. M40 Warwickshire - One lane closed and heavy traffic on M40 southbound between J12, B4451 (Gaydon) and J11, A361 (Banbury), because of a broken down vehicle. After emergency services dealt with an incident by Kings Langley, lines have now reopened. All services by London Midland and Virgin Trains are getting back to normal, but delays and cancellations are expected throughout the afternoon. The Priors Hall development was a major part of a "North Londonshire" marketing campaign, which featured adverts voiced by Sandi Toksvig and described the area as "idyllic". However, homeowner Julie McCallum (pictured) said: "When I look at the advert now it actually makes me laugh." She continued: "It cost us a lot of money to move. What we thought we were buying and what we actually got were two very different things. "It's been an expensive disappointment for us". Hughie Coull, who has lived at Priors Hall for five years, told me: "It looked nice and I thought there'd be country walks, a pub, shops and play areas for the kids, but we've got nothing." The website advertising houses at Priors Hall in Corby says the development is "set in 1,200 acres of parkland in Northamptonshire". It says it offers "acres and acres of green open spaces and parkland", "woodland walks" and a "stunning eight-acre lake". Corby Developments Limited and BeLa Partnership Limited called in administrators Deloitte in October 2016. Delloite said in a statement it was "now working to find a new investor to complete the development of the site". M1 Northamptonshire southbound severe accident, at J18 for A5. M1 Northamptonshire - M1 lane closed on entry slip road southbound at J18, A5 (Rugby), because of an accident. People living at Priors Hall Park in Corby say they've given up waiting for amenities to be provided. The development was a major part of a marketing campaign that branded Corby and the surrounding area "North Londonshire", to encourage commuters to Northamptonshire. The first residents moved on to the development in 2010 and planning permission has been granted for 5,100 homes. Only about 600 have been built so far. The companies behind the development went into administration last October. 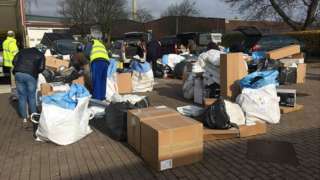 Administrators Delloite said "material progress" was being made, although it acknowledged some residents were "frustrated". In the last couple of days we've been discussing the confusion over whether an urgent care centre in Corby will remain open, with the current operators looking to pull out by the end of the month. The Corby Clinical Commissioning Group (CCG) has said in a new statement it is "working to ensure that the Urgent Care Centre will not close and that staff who deliver the services will continue after 31 March 2017". It says it will, if necessary, bring in a new provider if Lakeside Plus vacates the site. However, yesterday Lakeside Plus said the centre would close next Friday when its contract ends, unless funding from the NHS increased. It said Corby CCG had not put forward another provider and it owned the building and either owned or leased much of its equipment - so if a new provider came in it would need to work with Lakeside Plus. It added it also employed the staff, not the CCG. Corby CCG said: "Lakeside Plus has made a number of claims on which the CCG and their legal advisers do not agree", but did not give any specific examples. So whether you'll still be able to use the centre next week, or have to go to A&E in Kettering for your ailments, remains unclear. Pallets included packages from major brands including Next, H&M, Panasonic and Groupon. The FA People's Cup is back! It's the semi-finals stage of the FA People's Cup this weekend and you'll be able to keep up with all the action on our live text pages from 10:00-18:00 on Saturday and Sunday. There'll be loads more cracking goals like these ones, analysed by the Football Focus team after the first round. England Six Nations-winning trio Dylan Hartley, Courtney Lawes and Tom Wood are back in the Northampton Saints side this weekend to face Leicester Tigers at Franklin's Gardens. France's Louis Picamoles and Wales' George North also return for the East Midlands derby. Northampton opticians Sheinmans have been getting in the Red Nose Day spirit. Find out how you can raise money for Comic Relief here . The cloud will continue to break up during the afternoon, so it will become sunny and mild later with a high of 12C (54F). There are more details on the BBC Weather website . Due to the ongoing incident at Kings Langley, coaches will be running between Northampton and Watford Junction on all London Midland services. Alternative transport will also run between Northampton and Wellingborough. Virgin Trains has also cancelled services between Milton Keynes Central and Watford Junction. Tickets are now being accepted via other routes.